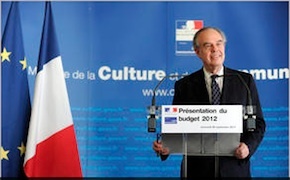 Compared to certain European countries, the French Culture budget has been spared drastic cuts. But we also know that numbers can be easily manipulated. And that the bill for revising the Finance Law continuously amends - lowering but never increasing - the figures proudly announced by Ministers in September of each year. The 2012 budget is no exception to the rule, and the cold shower is particularly chilly . No less than 21,180,000€ previously promised have been cancelled, as well as 23,180,000€ in credit allowances. This represents, respectively, 26.02% and 26.61% less than was announced by the French Ministry of Culture which had boasted an increase of 0.8% in credit allowances compared to 2011. In fact, if the overall budget, for the moment rejected by the Senate, were to be voted as presented by the government, the credit allowances would thus decrease by 1.9%, that is a difference of minus 2.7% announced by the Ministry. Unlike the 2011 budget which we had carefully studied last October 2010 (see article in French), we did not write anything when the 2012 budget was presented. We had not had the time to study it thoroughly and we do not publish press releases without first verifying the facts. Doing so every year is basically not very useful given the fact that the figures are so fuzzy. Between the announcements made in September, always flattering for the budget bill, the Revised Finance Law at the beginning of the year reducing it, and the statistics published at the end of the year giving actual expenses which are always lower than forecasted, said budget (and it no doubt is the same for all of the ministries) is not true in a strict accounting sense. Unfortunately, as we had already stated in 2010, the budget for the Ministry of Culture is always an exercice in trompe l’oeil. 1/ The phrase “which represents 26.02% et 26.61% less than announced by the Ministry” does not make any sense : The decrease is of 2.69% for credit allowances and 2.66% for authorizations of commitments compared to the funds voted, that is the funds finally approved by the Parliament, based on the figures presented by the government. 2/ Every year there are cancellations/openings (in response to unexpected events), so it is useless to compare what was voted for 2012 (the Loi de Finances 2012) halfway through the year and the amounts which remain available after the first Loi de Finances rectificative. When making comparisons, it is generally between LFI - LFI and between executed budget – executed budget. 3/ The planned cancellation in the first Loi de Finances rectificative for 2012 concerns frozen funds (=set aside for the precautionary reserves) of operators. Given the fact that these funds were frozen, the operators did not include them when establishing their budget. Consequently, the cancellation does not impact them in any way. 4/ Funds for heritage increased by 17% between 2007 and 2012. The French Ministry of Culture is absolutely right on point 1. Obviously, the decrease was not of 26.02% and 26.21% compared to what was announced (an absurd amount). This was a typographical error (misplaced period). The figures were, respectively, 2.60% and 2.66% (we have now made the correction). As concerns the rest of the Ministry’s explanation, we maintain everything we wrote and the ensuing conclusions. There is indeed a decrease in funding, contrary to the Minister’s announcement in September. It makes sense to compare the promises with the actual reality. We would like to thank Bernard Hasquenoph, of Louvre pour tous, who pointed out this fact which we had previously overlooked.